Southworth Sailor: Suprise! Surprise! Surprise! Wasn't there a house there before? On our way up to an Eide Partner's stockholders meeting in Marysville, we decided to detour I-5 traffic and tour our old stomping grounds in Pinehurst. As we approached our familiar driveway, we noticed that something was very different. 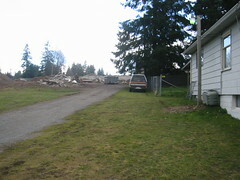 The cursed trees and the familar parsonage were gone. Cyclone fencing guarded the entire property. We thought maybe it was ground zero! We drove to the back of the JW church for a closer look. As we were surmising the fate of our once beloved abode, Esther spotted a familar ugly brown in the corner of her eye. Behold - the pathetic structure had been hoisted on steel beams and hauled over to a neighboring alley for a new lease on life. (Check out more pics by clicking the picture) We drove around to a new vantage point and reminisced of life in the fishbowl with three young boys.